Computer-loving Nissan fans in Japan are probably in ecstasy right now after NEC announced that it is to sell a special edition laptop there done up to match the local equivalent of the car company's Micra model. The Nissan March (as the Micra is known in its homeland) PC goes on sale on Wednesday and is ugly enough to fit right in with the Halloween trick-or-treaters. 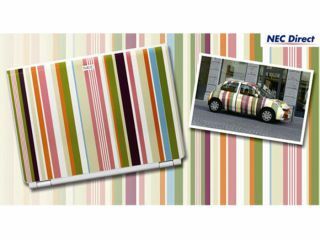 For ¥120,498 (£512), eager shoppers will get a stripy laptop that looks rather less Paul Smith and more garish mistake. Aside from the case of the PC sporting special-edition March colours, there's a Nissan logo above the keyboard and it comes with a slipcase made out of - get this - the same material Nissan uses in the March's seats. We're not making this up - you'll just have to trust our Japanese translation on this one. If you haven't turned away in disgust by now, we may as well tell you that the computer is actually a standard LaVie G model with a 1.8GHz Sempron 3400+ CPU, 512MB of RAM, DVD-ROM drive, a 15.4-inch widescreen and Windows Vista Home Basic.